Yes -Thousands of unsuspecting (gullible) internet surfers are being robbed of millions of dollars by Internet fraudsters every year - and it seems to be getting worse. In the past few days alone, reports in newspapers from Canada, The United Sates, England, the Philippines and other countries highlighted many of the successful Internet Scams - successful for the criminals - devastating for the innocent people sucked in by visions of easy money. Example - last year the Nigerian Scam cost 152 Canadians 5.2 million dollars. Another 4000 lost an estimated 18 million through fake lottery letters. Not bad enough, 4633 Canadians had their identities stolen and were defrauded to the tune of 6.4 million dollars. And it's not just happening to Canadians. Do a quick Google search for Internet Fraud News and you'll see reports from California to New England on millions of dollars being stolen from thousands of naive citizens. High speed Internet access and sophisticated software make it easy for the cyber crooks to blast out 10's of thousands of the fake emails - and even if their hit rate is only 1 in 10,000, they can steal thousands of dollars and personal identities from that one unlucky person alone. There are literally dozens of internet scams, some so subtle and clever that it's difficult to avoid being suckered in until it's too late. Unfortunately, Senior Citizens are among the main targets. Not many of our elders (who may still be on the Internet Surfing learning curve), are aware of the many scams being aimed at them. I prepared a brief Free report that describes 12 of the most prevalent scams. It's in PDF format, easily downloaded at only 7 pages, easy to print, read, and share with your families and friends. Here's your opportunity to help a less experienced person avoid the loss of critical financial resources and still enjoy the pleasures of the World Wide Web. If you found this post to be useful, please subscribe to my RSS feed! ... a good data file backup routine would be an asset for anyone who creates important personal or private business data files. I'm tempted to introduce this article with "I Told You So - Beware of the malware or This Could Happen To You"
It's an excellent case history example of the dangers lurking on the Internet and it very aptly demonstrates the sophistication and cleverness of the malcontents and cyber criminals who are polluting the World Wide Web with Trojans, spyware and worse. Botnet owners and organized crime, no longer just adolescent joy seekers, are out to steal our identities, personal financial information, Social Security numbers, and safe use of the Internet. As an experienced web master and Internet Marketer, Eric Holmlund had the knowledge and experience that enabled him to take the proper actions to overcome the infestation in his computer. Since many of us are less able to figure out how to respond to Computer Killer attacks like this, I asked Eric if his experience could be used for this article - it's loaded with helpful tips. Read how Malware almost Killed this expert's computer - and what he did to recover. March 3, 2008 Hacker Bait - Computers Always "Online"
A Reminder - Hackers accessing and taking control of a computer is a serious risk today with the widespread use of "always on" broadband internet. Hackers exploit vulnerabilities in legitimate software or use trojans or viruses they have implanted to gain control of a computer. They can then use that computer to send unsolicited commercial emails (spam) or for other illegal activities. The idea here is to shield the Hackers from detection as the illegal activity appears to originate from the computer they have taken control of - possibly yours. In order to minimize risk of hacking attacks, it's important to ensure that software used - including the operating system - is kept up to date by installing all vendor supplied updates and upgrades, especially the critical and security related updates. An effective firewall is a vital defense against unauthorized access by third parties. A firewall could be installed on the modem used to connect to the internet or as a software program that runs on the computer. It serves to control who and what programs are allowed to accept or make connections with the internet. A firewall can also be useful in detecting and controlling programs like keyloggers which attempt to call home. Does all of this sound familiar? Of course it does. So today's reminder is to encourage you to be sure your protective tools are up to date. At her "Net Family News" blog today, Anne Collier posted comments on how sites like Facebook make it easy for school students to bully their peers. The example cited refers to student activities in a Palo Alto California high school. Thanks go to Ms. Collier. She is again alerting parents to cyber bullying activities that we may never hear about from our kids. See my January 15th post on Cyber Bullies and our teen aged children. This is really important information if you have teen age children, or know someone who does. Read here post HERE. Sometimes Parents, and especially the Grandparents among us have to struggle a bit to understand, and even communicate with our teen aged children and grandchildren. On this website and blog, we talk about many of the risky issues they live with every day and we're anxious to help our teenagers enjoy their growing up experiences in a safe manner. We have a major responsibility when parenting teenagers for their safety and often find it a challenge to convey our concern in a "language" acceptable to them. ... maybe it will help you, too. appropriate for their viewing requires serious parental controls, rules, and guidelines during "at home Computer time". Children may protest but a few hours of their complaints is well worth the peace of mind knowing that nothing should be getting through that you don't want them to view. No doubt that this will result in some difficult moments, especially when your teenager's friends may have greater computer surfing liberties in their homes. Peer pressure can be a major problem for teenagers. You can help make it easier to handle for them if you let their friends' parents know that you are enforcing strict computer safety rules in your home. Share your methods and invite them to tell you how they are handling internet security in their homes. More on this challenging parental responsibility in the Article "At Home Security for Kids". Enlist your teenager's help and make it a Family Safety Project. The internet has sometimes been compared to the wild, wild west. Part of the reason is because in those early days of the frontier, the law was in place to protect citizens of the land but in many cases, it was hard to enforce and outlaws ran free to defy laws without fear of being stopped. Today's cyberspace is in many ways, an untamed frontier. The cyber predators may not be as evident as were the "cowboys" and "outlaws"
who were fairly popular in Tombstone, Arizona, scene of the OK Corral shootout. Unfortunately, today's "cyber outlaws" hide behind the anonymity of the Internet where they can't be seen. Because of this unprecedented access through the Internet and wireless communication, Protecting Kids from Today's Online Cyber Bandits requires new strategies to be developed for law enforcement. 1. Install Anti-virus and Anti-spyware software on your computer before you start surfing the first time. The difference between a computer virus and spyware is - a virus is a malicious piece of computer code that can be planted on any computer and can result in destruction of your file systems. A spyware program collects information about you without your knowledge or consent. Spyware does not spread like a virus. It doesn't hurt to take a few minutes to refresh your thoughts on the security of your computer system - one of these reminders might just save you from a lot of virus grief. Technology has improved their cells dramatically providing many advanced mobile features which have increased potential risks in terms of both privacy and security. Parents and teenagers alike need to be aware of these threats. There's a great post on cyberbullying by Anne Collier on her Net Family News blog. There's a major need for education here - for both our children and their parents. Do you have an answer for Anne Collier's question? - "What is it going to take to convince teens of how important it is to think about the impact mean behavior can have online? " will help save a few teenagers and their families from a lot of grief. May I ask you another question? How did you teach them to be "Safe Surfers"? There are probably a lot of parents or guardians reading this who would benefit from your successful experiences. and please tell us how you taught your children to be safe online. Read how one Mother handled the situation after her son 'accidentally' surfed onto an adult entertainment website, and how another parent selected a strategic place to supervise their children's surfing forays. You can tell us anonymously, if you wish. Just type your story into the text box form on the Invitation web page. Nothing to buy - you don't even need to leave your email address and leaving your name is optional. Your experience is invaluable and will be appreciated by those of us whose families still have young ones at home, or have friends with young kids. When They Were learning to Surf the Internet? As parents, grandparents and guardians, we are reminded constantly to help our children enjoy the pleasures and excitement of the Internet in safety. My own grandchildren learned how to boot up their family computers at a very early age. For the youngest of them, it was simply a matter of watching their older sisters and brothers as they chatted online with their friends, worked on their school lessons, and explored the mysteries of the cyber universe. Informed parents recognize that the Internet provides an exciting and learning experiences for their children. Teaching online safety, and learning together is a wonderful way for any family to enjoy it. Your experiences and successes could help a lot of other parents and us grandparents. (*)I'm a proud grandparent of 9 precious grandchildren and the last thing in this world that I ever want to see is someone hurting them. I'm certain that this doesn't make me any different than every other parent, grandparent or child guardian. What is a bit different, however, is that I have an opportunity to help other parents and grandparents do something to help protect our young children from the most heinous people who prey on them when they're playing on the Internet - the pedophiles and child predators hiding in the cyberworld. I do this through my websites and blogs - usually through news alerts and product announcements. This message is a product announcement. The product is an eBook I just prepared from information I purchased. I bought it because it seemed so complete, and thorough, that I believe it will enable all of us to help our kids more easily understand how serious, and cautious they must be when visiting the Internet. Yes, there's a price for this one, but it's only $6.95, and you can download it from the internet and start using it almost immediately. If you order the eBook and find that it doesn't help you understand, and explain the threats that these creatures pose, then I'll return your money. (Within 60 days of your order). It's not the money, the most important issue here is the safety of our children, as you'll see when you visit the order page. 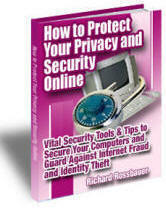 It's loaded with Vital Security Tools and Tips to Secure Your Computers and Guard Against Internet Fraud and Identity Theft. I slashed the list price by 61 percent from $17.95 to only $7.00! And to make it available to even more of the internet users who can really benefit from its wealth of security information, I have included free resale rights that will give you 100 percent of the profits for each and every copy you sell. Your profits will go directly and immediately into your own PayPal account. Even better, the $7.00 price includes the free bonus eBook - "PC Security", my Info Guide to Beefing Up Your Personal Computer's Safety from Malicious Threats, with dozens of easy to apply ideas and strategies to strengthen your Security Fortress. It's really important that everyone be aware that Clever Internet Thieves from all around the world are using very highly sophisticated and stealthy infiltration schemes to plant trojans, worms, viruses and other malware in their computers, and could even be secretly adding any one of us to their botnets. Even if you are reasonably comfortable when going online, your family members and friends may not be as experienced as you. Give them the gift that can save their families and friends from potential hours of grief, plus potential loss of money and identity to these Internet thieves. Refer your friends to your very own sales page for "How to Protect Your Privacy and Security Online"
Thanks for helping to make the internet a safer and more fun experience for everyone. 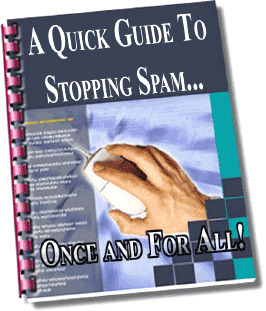 I hope you encourage your family and friends to get this free guide - it could keep them from innocently sending infected email messages to you. In fact, I just got a big advantage myself today because I've been paying attention to what Ken McArthur has been up to with his new site. You see, Ken is going to be giving away some pretty amazing resources over the next six months as part of a HUGE book launch, an incredible coaching program, and a massive home study course. He's been preaching about moving up the value of the materials that you GIVE away for a long, long time so ... That means there are some great ZERO COST materials coming! Get your Profitable Blogging Tips FREE email course - Key Tips for Successful and Profitable Blogging - Dozens of vital proven tips sent to your email address over the next few days - read them, print and save them. Start Blogging Now! A breach in your personal privacy protection could easily lead to hackers, online, and offline thieves stealing your identity. 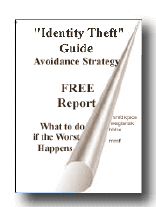 Identity Theft is the fastest growing crime in America, affecting approximately 900,000 new victims each year! If you're not comfortable with RSS feeds, I'll send you a brief email each time I update this blog with an important Security Tip or Alert.